The Jyhad rages amid the skyscrapers and nightclubs of the modern world, as vampire elders - the oldest and most powerful Kindred - impose their law upon the young and newly Embraced. And yet the neonates, despite their thin blood, rebel to choose their own fate. It is an ages-old battle, an eternal struggle. Age and cunning or strength and passion - which will rule the night? War of Ages brings the dtruggling factions of the Kindred Jyhad together in one tumultuous book. 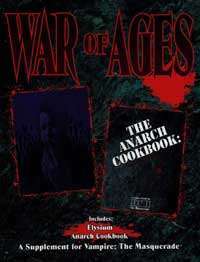 A collection of the original Elysium and Anarch Cookbook under one new cover, this book offers a last chance to put down the upstarts or tear down the vampire establishment, once and for all. Your last chance to get these Vampire sourcebooks.